A monster roams the night in the sleepy town of Charlotte... This is not your bedtime fairytale. Not your safe and sweet ending. It's not the story you grew up with, but it's mine to tell. *** There's a wolf, and there is Cassandra Hood. Sweet, innocent, and always willing to help, she could never do wrong. When a horrible event happens in her younger years, she's taken away and grows up feeling the hatred for the nightmare haunting her town. It seems like no one will believe her about what she saw way back then. That there is no possible way the horrors stalking the night were... werewolves. There are three men who do believe her though. A long-time friend who has been in love with her for years, the therapist's son who has called dibs, and the stuffed-shirt assistant professor who opens her eyes to a new world. And when two burly lumberjacks, who take what they want, join in? They go hunting. Cassandra's goal is always to fight for what she believes in. While two wrongs don't make a right, in this, the werewolf has to die. All she needs is the confidence resting under the cloak of her Crimson Hood. "Grandpa, what big ears you have," I mocked, holding my whip. "Bet you wished you finished that fairytale now, don't you?" The werewolf snarled at me. 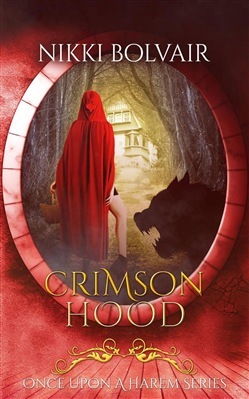 Acquista Crimson Hood in Epub: dopo aver letto l’ebook Crimson Hood di Nikki Bolvair ti invitiamo a lasciarci una Recensione qui sotto: sarà utile agli utenti che non abbiano ancora letto questo libro e che vogliano avere delle opinioni altrui. L’opinione su di un libro è molto soggettiva e per questo leggere eventuali recensioni negative non ci dovrà frenare dall’acquisto, anzi dovrà spingerci ad acquistare il libro in fretta per poter dire la nostra ed eventualmente smentire quanto commentato da altri, contribuendo ad arricchire più possibile i commenti e dare sempre più spunti di confronto al pubblico online.